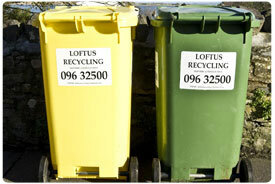 Loftus Recycling provides wheelie bins in various sizes to suit each customer’s specific needs. With bins ranging in size from 240 Ltr to 360 Ltr wheelie bins for domestic customers and up to 1100 Ltr for commercial customers, the choice is yours. Contact us today and we’ll tailor a service to satisfy your needs and your budget. Loftus Recycling operates a 2 bin collection service for domestic customers to allow for separate collections of general waste and mixed recycling. Contact our office on 096 32500 for further details. Collection calendars for each area are available on the Collection calendar page.